The reason we don’t offer generic law firm website templates is because the firms themselves vary so dramatically. The personalities of the lawyers, the communities in which they practice, each firm’s history, and the demographics of their clients will always lead us in different directions. We think that law firm websites reflect the core values of each firm. 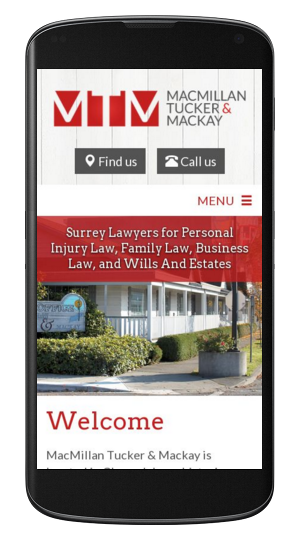 The Cloverdale lawyers at MacMillan Tucker & Mackay had tried a number of website options. They came to us because they were looking for an alternative to FindLaw, a subscription-based website marketing platform. 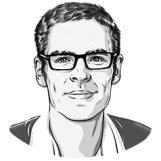 They preferred a site that could be owned rather than a proprietary subscription service requiring significant ongoing fees. While Cloverdale is known for its rodeo, the community is booming with local businesses and young families. We wanted the new site to put Cloverdale and the firm’s distinctive office front & centre. MacMillan Tucker & Mackay (also known as Mactuc) offers legal services just as good as you would get from a big downtown firm, without having to leave Cloverdale. Besides emphasizing the community, our priority is always to provide an excellent user experience. The site responsiveness pushes users towards calling and mapping on mobile devices. Similarly, optimizing page speed means that users don’t need to wait on slower connections. We needed to quickly show what the firm does, who the lawyers are, and how they can be reached. We also ensured that the consultation form would be ubiquitous throughout the site. These latter conversion points, combined with monthly reporting, help the firm assess whether the website is working. The firm’s office inspired the visuals. The distinctive porch and white panelling is the perfect antidote to the impersonal glass of a skyscraper. We also used a number of images from the fairgrounds and of the Cloverdale historic core. We think it works well. And now, our friends at MacMillan Tucker & Mackay are the proud owners of a shiny new website: Mactuc.com. A whole new look for 2016.